Continuing our exploration of the works of Mrs. Alex. 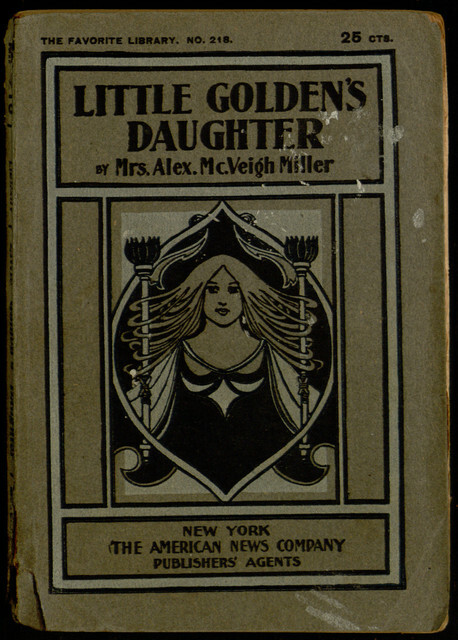 McVeigh Miller, this week’s new proofreading project is Little Golden’s Daughter; or, The Dream of a Life Time, in an edition published as part of the American News Company’s Favorite Library. The story was first serialized in the Family Story Paper from June 5, 1882 to September 4, 1882. While many of Mrs. Miller’s works have aged surprisingly well, this story appears to suffer from some painful racial stereotyping — be warned in advance before you dive in! 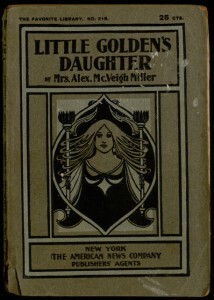 Because Little Golden’s Daughter is a relatively short novel, the Favorite Library edition contains two filler stories: “A Mock Idyl” by Percy Ross and “Farewell” by W. H. Stacpoole. We are releasing both of these short works for proofreading at the same time as the main tale. To learn more about our proofreading efforts, which turn digital images from our collection into modern e-books, read this earlier post. To get involved and help with the work, pick the project page of your choice: Little Golden’s Daughter, A Mock Idyl or Farewell.